Market sentiment: nervous. Despite still-growing corporate earnings around the world, and decent GDP growth expectations for this year and next which will support future earnings growth, investors remain deeply uneasy after a torrid month for risk assets. There is suspicion that the recent sell-off may turn into something more than a correction, and that it heralds the end of the near decade-long bull market that began in March 2009. Furthermore, investors find themselves in an unusual situation in which stocks and bonds have been weakening simultaneously, with only cash and the safest short duration government bonds offering safety. Is this the beginning of a bear market? All bull markets end in a bear market, but it seems premature to call this the beginning of one. Wall Street has not, yet, even entered correction territory which defined as a 10% fall (although granted that some smaller ones, such as the FTSE 100, have). However, given that the U.S accounts for 59% of the MSCI World index and its movements set the tone for other markets, it is the one we focus on. As the chart below shows, the S&P 500 (the white line) ended last week 9.1% down from its recent record high. We have seen similar sell-offs before in the current bull market, only for a recovery rally to set in. Bear market? Not yet even a full correction. Note to the above chart: the S&P500 (while line) since 1st January 2008 is up 82%, or 5.6% at an annualised rate. With dividends reinvested (orange line) the S&P500 is up 128%, or 7.9% at an annualised rate. The chart starts before the 2008 financial crisis prompted the most severe stock market fall since the 1920s, and illustrates how a ‘buy and hold’ long term investment strategy, with reinvesting dividends, can overcome short term challenges posed by bear markets. If the charts don’t suggest a bear market is in progress, what about fundamentals? U.S third quarter corporate earnings growth has been generally good: just under half the S&P 500 companies have so far reported and of these 80% have surprised on the upside. Stronger than expected third quarter U.S GDP growth, announced on Friday, at 3.5% annualised, supports the theme of a fast-growing U.S economy. Meanwhile, central bankers around the world, from the U.S Fed, the ECB and the Bank of Japan, see their domestic economies as being strong enough to withstand tighter monetary policy in the form of higher interest rates (the Fed) and/or a reversal or a curbing of their quantitative easing policies (all three). The financial sector is relatively secure, with large banks in the developed economies having better capital ratios and liquidity provisions than they have for twenty years. Italian banks are the notable exception. So why are investors worried? The primary fear is that tighter global monetary policy, from the three main central banks, will raise global interest rates and bond yields to levels that challenge valuations on risk assets. For instance, why should an income-seeking investor continue to take on stock market risk if risk-free rates, such as those available from bank account cash or government bond yields, are increasingly similar to dividend yields? And would an investor in growth-orientated stocks remain confident in future profits forecasts if the company’s cost of borrowing is rising, and consumer and corporate spending growth looks set to weaken in the broader economy? Given recent falls in U.S inflation, in both the CPI headline rate and the Fed’s preferred PCE measure, and the widespread assumption that strong U.S growth this year is partly supported by the one-off effect of Trump’s tax cuts, fear that the Fed is tightening monetary policy too fast is understandable. In the euro zone, the ECB appears determined to ignore the potential ramifications on Italian government bond prices, and the balance sheets of Italian banks that hold large quantities of government bonds, when it ends its asset purchase program in December. In addition we have geopolitical worries, of which the impasse between the U.S and China over trade tariffs is the most significant. Should the recent slower growth seen in China persist, perhaps aggravated by U.S tariffs on its exports to America, a devaluation of the renminbi may be seen by the Beijing authorities as a least-damaging way to boost growth (compared to ever-more borrowing by corporates, households and municipalities). This would potentially unleash a tsunami of deflationary forces, resulting in a global ratcheting up of trade barriers. Central banks can halt their monetary tightening policies. The good news is that central banks can press ‘pause’ on their monetary policies. The Fed would provide massive reassurance to investors if it acknowledged that the risk of U.S inflation getting out of hand is low, that U.S economic growth is likely to slow next year, and therefore it will suspend its planned December rate hike. Critics will say it is giving into pressure from the White House, but given the recent inflation data that can surely be brushed aside. The ECB faces a more profound problem, in that continuing with its Q.E program because of the behaviour of a reckless Italian government will appear to be giving in to political pressure. However, the risk of a ballooning of both Italian government debt and bond yields leading to a banking crisis, with ramifications across the euro zone, may justify some flexibility in approach. Call it appeasement, but no central bank operates in a political vacuum. Avoid the temptation to switch investments. A properly diversified, long-term investor, would do best to sit still rather than attempt to look into a crystal ball. It is hard enough to divine what might cause the commencement of the next bear market when it does come (eg, too much inflation or too little growth? ), let alone to anticipate which asset classes will be the best ones to hold. What is called ‘market timing’ rarely delivers what is intended, with investors selling too late into a downturn and buying back their stocks well after the recovery rally has begun, with only the stock broker profiting. 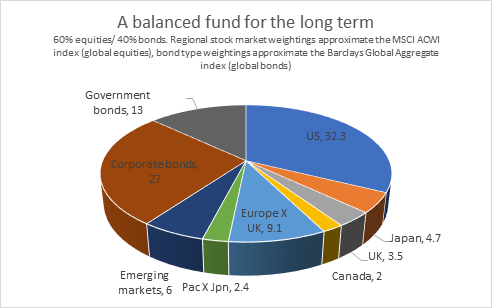 An illustration of the benefits of a well-diversified multi asset portfolio (such as the one described at the end of this note) is that even though bonds have also weakened lately, some areas of the fixed income market continue to offer low or even negative correlation with stocks. The Barclays Bloomberg U.S Short Treasury index is up 0.16% since the start of October, and the Global Aggregate index of investment grade bonds is down just 0.5%. Bonds may be boring, but their role in a portfolio is to reduce overall portfolio risk (volatility), not to make an investor rich. The returns of the two bond indices contrast with a 8.8% fall in the MSCI U.S index over the same period, and a 9.9% fall for the MSCI World index (all in dollar terms, dividends reinvested).